The vast majority of Internet providers offer personal email accounts to their users, that have certain limitations, that can be somewhat bothersome, that is why a program like miniRelay can be of great help. With this simple application we will avoid these restrictions, because we will be able to send emails from our own SMTP server, being only necessary to configure the application to use IP 127.0.0.1 as the SMTP address instead of using that of the Internet provider, thus helping us to avoid any restriction on the number of emails that you can send. The program has a very simple interface, on which we'll see the connection that the application carries out or the configuration panel, where it is possible to change the tool's preferences. 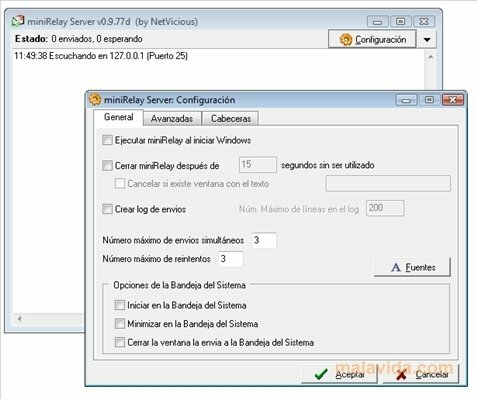 If you want to avoid the restrictions to send emails imposed by many Internet providers, don't think twice and download miniRelay as soon as possible.